Howard Webb sent in this Young & Co postcard image showing Brentford Monument, presumably not long after it was erected in 1909. 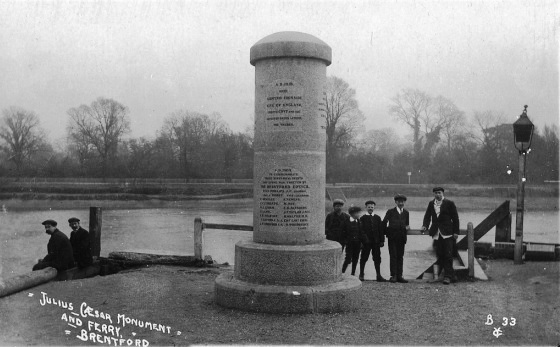 The monument was constructed from two cylindrical blocks of granite from Brentford Bridge used to support lights until the widening of the bridge in 1900. 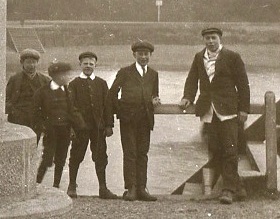 The photo shows the monument at its original site on the wharf at the end of Ferry Lane. Gillian Clegg recounts in 'Brentford Past' how the monument became buried in coal unloaded at this site. It was rediscovered in 1955 and Varley Pumps & Engineering of Ferry Lane rescued and repaired the monument. It was moved to the west side of Ferry Lane in the same year. This became a rather dank area with grafitti on nearby brickwork and the monument was moved again to its current site outside the County Court in 1992 (corner of Alexandra Road and High Street). Biographies for many of the above are available. 'Brentford As It Was' and 'Brentford Past' include a photo of the unveiling ceremony, 12 May 1909, by the Duke of Northumberland. See another view of the monument.